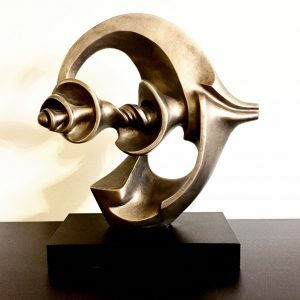 Michael Aaron Gallagher’s love for sculpture began as a child, when he studied the works of Romanian artist Constantin Brancusi. Seeing Brancusi’s sculptures firsthand in New York and Philadelphia, left an indelible impression and shaped his appreciation for modern abstract art and cubism. The sweeping curvature of his “Bird in Space” series and the futuristic look of “Portrait of Mademoiselle Pogany,” was the aesthetic Michael wanted to achieve in his own sculpture collection. 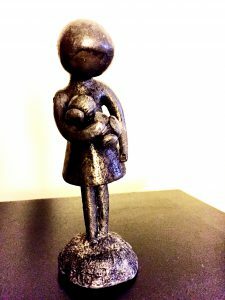 “Girl with Teddy Bear” sculpture. Although he owns very few modern sculptures, “Metamor-fish” and “Girl with Teddy Bear” summarize the ideal of perfection through simplicity.